It was a beautiful, warm Sunday in September when we decided to venture into the pretty little seaside town of Shoreham-by-sea. I know Shoreham very well as my Mum grew up here and so as children we were brought here often. One of my main memories is looking up at the giant statue of the fisherman on the roof of a pub before walking across the newly renovated footbridge. This Sunday however, we walk a little bit further down the high street to the grand looking Old Town Hall which is now the modern family run restaurant, Chambers Bistro. I’ve eaten here twice before and both times were considered ‘special occasions’. Though Chambers is affordable and the service very informal and relaxed, it has an air of opulence about it which makes you think ‘special’. However, this occasion was just that we fancied Sunday lunch somewhere different to the usual traditional pub. As we walked in, we were greeted warmly by the young, smiley waiter standing by the door. He asked us if we’d made a reservation and as soon as we told him our names, he knew exactly where our table was. No fuss. We were sat at a little table right by the outside patio on the river. 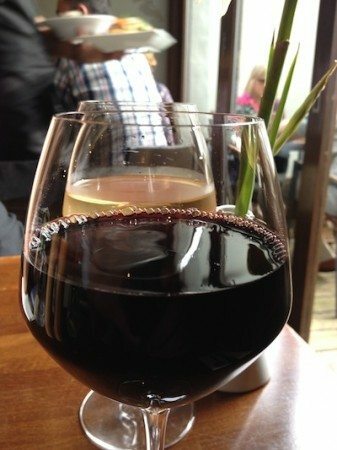 I thought how lovely it would be to sit by the river with a glass of wine on a summer’s afternoon. There were rainbow coloured Gladioli’s on every table. This seemed almost out of place with the rest of the sophisticated décor. Deep burgundy walls, silver grey sparkly wallpaper and dark wood furniture. However, it actually worked. It seemed to represent the fun and relaxed nature of the owners and staff. There were also strings of rainbow coloured paper lanterns framing the special boards. The owner gave us a minute to settle before coming over and introducing herself with a big smile. She seemed genuinely pleased to see us and asked us if we wanted a drink or an appetiser to get us going. 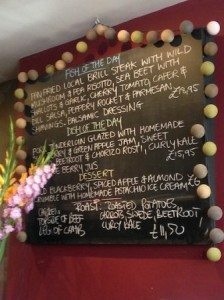 We needed a bit more time with the menu so she let us be after drawing our attention to the special board. 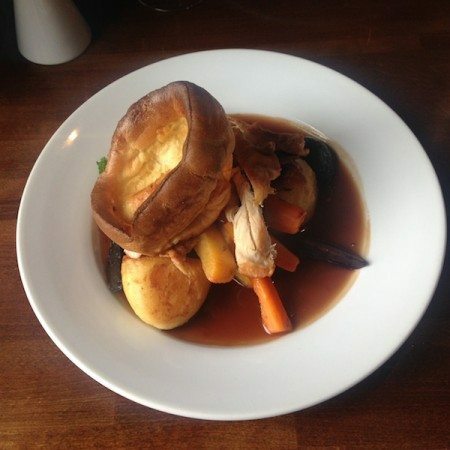 Unlike a lot of places on a Sunday, the a la carte menu was presented to us as well as the choice of Sunday roasts. Although, there were a great variety of choices on the main menu, we both had to go for the roast. It almost feels like a betrayal to Sunday roasts themselves to choose something else on this day of the week. So, I went for the Roast Chicken and my boyfriend Tommy went for the Lamb. As well as the extensive main menu, there were also several special’s on the chalkboard which all looked very tasty and interesting. Like the stuffed pork tenderloin with chorizo. They even use locally foraged ingredients from the hedgerow or the sea. A special touch of something local. Although it felt naughty, we did look at the starters and decided we couldn’t bypass this course. Everything on the list was something I wanted to try but I had to choose one, so I went for the Chambers Egg Royale. 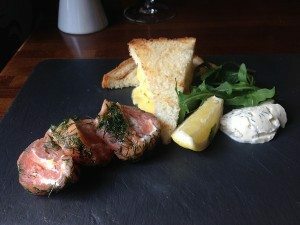 This was scottish smoked salmon, creamed cheese and dill roulade with free range poached egg and butter brioche. This was presented neatly and stylishly on a square slab of slate. The egg was cooked perfectly and each flavour was a delight. Tommy chose the seared king scallops on creamy pea puree, crispy bacon and port reduction. 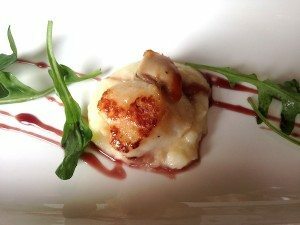 There were three scallops in a row on a long white plate with a pretty swirl of the port reduction framing them. Unfortunately, I didn’t get a chance to try as Tommy finished them before I had finished my first bite. He certainly looked impressed. Although, it was a good 20 minutes before our roasts came, this was a really pleasant 20 minutes and felt like no time at all. It was a busy service with most tables of the large restaurant full. The staff looked very professional in black and seemed to weave in and out of the tables gracefully. 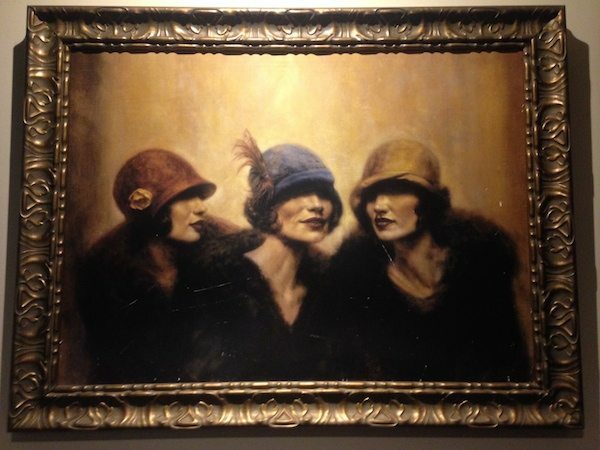 This along with the attractive décor and the soft, well chosen background music made for a very relaxing atmosphere. The splashes of colour in the flowers and the lanterns also come out in the staff’s personalities. Each one who served us did so with a big, genuine smile and often threw in a friendly comment or a little joke. When the roasts came they were both presented very well, with colourful, seasonal root vegetables around the edge and the meat and the Yorkshire placed in the middle. The Yorkshire was huge and obviously homemade. The meat was cooked well and plentiful. The chicken breast came on the bone and the lamb had just the right amount of fat in it. The veg’ was gorgeous – vibrant and still with a slight crunch. This is a huge score in my book as a lot of roasts out there include overcooked veg’ which can turn into mush. With this roast you could really taste each vegetable. Once we’d ‘accomplished’ our main feat, we took a breather as we knew we would have to make room for the desserts. The staff let us take our time and relax whilst perusing what there was to offer on the sweet side of things. They all looked enticing and creative. 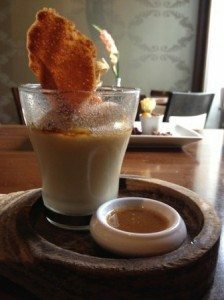 Tommy decided on the Cappucino Crème Brulee with cinnamon chantilly, almond tuile and amaretto sauce. 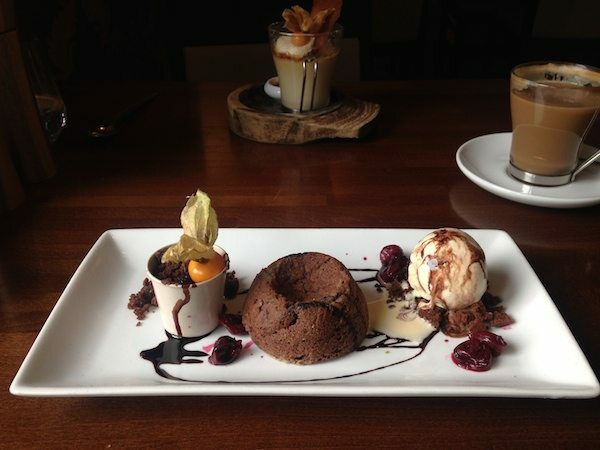 I went for the Chocolate and Orange Fondant with chocolate soil, glaced morello cherries and baileys ice cream. The flavour combinations of both desserts intrigued me. Both came out on plates, yet should have been on a canvas. They were as good as any work of art I’ve ever seen. Luckily, the taste measured up to the presentation. The desserts alone are definitely an experience I recommend. As we left, we both felt that we had got what we had come for and more. 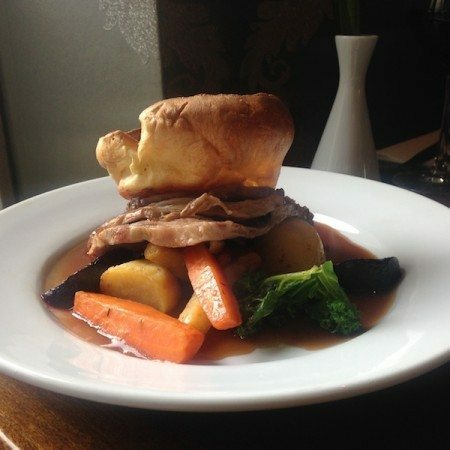 We had a great, quality roast in somewhere a bit more ‘special’ than just another pub. This ‘special’ was added to by the warm, visibly dedicated and passionate staff and the attractive surroundings. They definitely did what Chambers aim to do, ‘to provide a really great unforgettable hour or two away from it all’. Next time, we’ll come back for three.